When Zack Zettergren moved from a small town in Mississippi to Hendersonville, TN in January 1989 he was full of hope as a 10Year Old often is. Zack was saddened to be leaving his friends from his Senatobia Elementary School, but he was optimistic about a project his 5th Grade gifted education class had just completed. Zack's parents, Al and Bettye Zettergren, continued to encourage him despite the facts: His class was one of 6,000 schools that entered the OV-105 orbiter naming contest. In spite of numbers, Zack's class was announced as the National Winners by President George H.W. Bush in May of 1989 with the name, Endeavour. Zack and his family traveled to Washington DC that May and were honored by many dignitaries, including President Bush. A private reception was held by NASA at the Smithsonian's Air and Space Museum for the Zettergren family and the eight other students' families from his class. On May 7, 1992 Zack and his family attended the maiden voyage of the Endeavour as VIP guests of NASA. 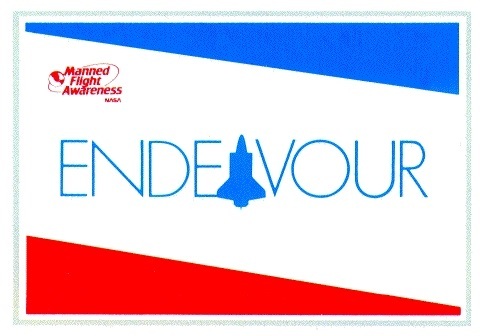 It was on that date that Endeavour left earth from a Launchpad in Cape Canaveral, FL to travel space for eight days and rescue a stranded satellite on mission STS-49. Senatobia Elementary school was one of more than 6,000 U.S. schools that participated in a NASA competition to name the newest shuttle orbiter in 1988. Led by teacher Martha Riales, the school's submission, "Endeavour," was first a state-level winner in the elementary school division. The national winners were Senatobia Middle School in Senatobia, Miss., in the elementary division and Tallulah Falls School in Tallulah Falls, Ga., in the upper school division. The national winners were selected based on the quality of the project submitted with their entries. They were honored at several ceremonies in Washington, D.C., including a White House ceremony where then-President George H.W. Bush presented awards to each school. The NASA Orbiter-Naming Project was part of a congressional resolution initiated by Congressman Tom Lewis of Florida. The resolution mandated that the nation's fifth orbiter be named by students because of the outpouring of concern from students after the Challenger tragedy. The competition was developed by NASA's Education Division and administered by the Council of Chief State School Officers. The competition was open to K-12 students enrolled in U.S. public and private schools. Interest was high. NASA received 6,154 entries, representing more than 70,000 students. Students could not suggest just any name. It had to be that of an exploratory or research sea vessel, be appropriate for a spacecraft, capture the spirit of America's mission in space, and be easy to pronounce for radio transmission. A required classroom project challenged students to research their suggestion from historical, scientific, technical and artistic perspectives. 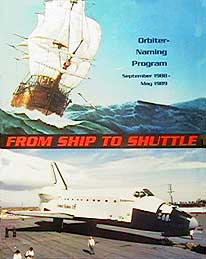 Entries included an essay about the name, the story behind it and why it was appropriate for a NASA shuttle, and the project that supported the name. Endeavour was the most popular entry, accounting for almost one-third of the state-level winners. The Endeavour was a ship belonging to the British Royal Navy. In their entries, students focused on the vessel’s first voyage under the command of seaman and scientist James Cook in 1769-71. Cook steered Endeavour to Tahiti in the South Pacific to observe and record the rare event of the transit of Venus, a celestial event that allows observers on Earth to see Venus passing across the face of the sun. Students drew parallels between astronomy on Cook's Endeavour and on the space shuttle; the payloads of medicine, science and commerce that were on both the ship and shuttles; and the make-up of the crews, both of which included scientists. Former NASA Educational Programs Officer Muriel Thorne managed the competition. She was also editor of a book about the competition, "From Ship to Shuttle," now out of print. Thorne said the national-level judging was based on the quality of the students' projects. Thorne and other NASA judges narrowed the choices to three finalists: Endeavour, Horizon and North Star. The final decision to name the orbiter Endeavour was made by then-President George H.W. Bush, based on recommendations by the NASA administrator. 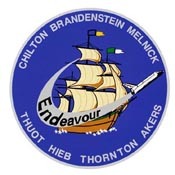 The winning schools were recognized in the patch design for STS-49, Endeavour's first flight. The STS-49 crew chose to include the schools' colors on the flags of Endeavour's masts. Endeavour was launched for the first time on May 7, 1992. Its most recent flight was STS-113 in 2002. STS-118 will be the spacecraft's 20th flight. Through competitions like the Orbiter-Naming Project, NASA continues its tradition of investing in the nation's education. To compete effectively for the minds, imaginations and career ambitions of America's young people, NASA is focused on education efforts that encourage the pursuit of disciplines critical to NASA's future engineering, scientific and technical missions. Of all NASA's space shuttles to fly in orbit, only Endeavour — the youngest in the fleet — received its name in the most unusual way: It was the only shuttle name selected by children. The fifth and newest of NASA's shuttles, Endeavour was named in a national competition involving students in elementary and secondary schools. The competition began in 1988 and the winning name was announced on May 10, 1989. Students were asked to pick a name based on an exploratory or research sea vessel that had previously sailed. Other requirements that students had to consider when selecting a possible name were that it had to be appropriate for a spacecraft and had to capture the spirit of America's mission in space. NASA also wanted a name that would be easy to pronounce clearly over radio transmissions. Each school's entries included an essay about the name, the story behind it and why it was a perfect fit for the new shuttle. Endeavour was hands down the most popular entry, accounting for almost one-third of the state-level winners. "The original Endeavour was a ship commanded by an 18th-century British explorer named James Cook," Kylie Clem, a representative for the space shuttle program at NASA's Johnson Space Center in Houston, Texas, told Life's Little Mysteries, a sister site to Space.com. On its maiden voyage in 1768, Cook, who was also a scientist, sailed the Endeavour into the South Pacific and around Tahiti to study and record the passage of Venus between the Earth and the sun. This rare celestial event allows observers on Earth to see Venus passing across the face of the sun. During another portion of his journey, Cook navigated the Great Barrier Reef and discovered New Zealand. Senatobia Middle School in Senatobia, Miss., was the national winner in the elementary division, while the Tallulah Falls School in Tallulah Falls, Ga., was the national winner in the secondary school division. Then-President George H.W. Bush presented awards to each school during a ceremony at the White House. The "u" in Endeavour's name has caused some confusion, but "Endeavour is spelled that way because that's how the British ship that it's named after was spelled," Clem explained. The name's spelling even caused a mix-up on the Launch Pad 39A at the Kennedy Space Center in Florida, on July 2007. In anticipation of the shuttle's arrival to the pad for its Aug. 7, 2007, launch, officials hung a large banner reading "Go Endeavor!" and posted a photo of the sign on the Kennedy Space Center's website. Once they realized that the sign was missing a "u," NASA personnel hurried to take down the banner from the seaside launch complex and replace it with one that had the correct spelling.